Residential Design Using AutoCAD 2014 is an introductory level tutorial which uses residential design exercises as the means to teach you AutoCAD 2014. 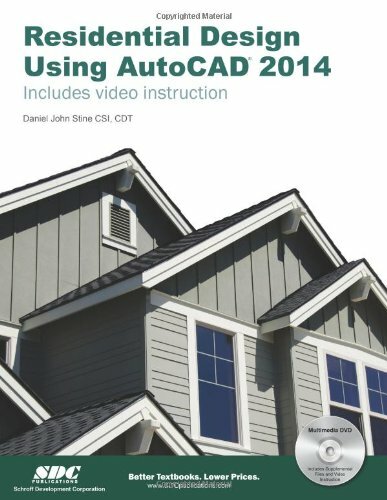 Each book comes with a DVD containing numerous video presentations in which the author shows and explains the many tools and techniques used in AutoCAD 2014. After completing this book you will have a well-rounded knowledge of Computer Aided Drafting that can be used in the industry and the satisfaction of having completed a set of residential drawings. This textbook starts with an optional section that covers basic hand sketching techniques and concepts intended to increase your ability to sketch design ideas by hand and to think three-dimensionally. The book then proceeds with a basic introduction to AutoCAD 2014. The first three chapters are intended to get you familiar with the user interface and many of the common menus and tools. Throughout the rest of the book you will design a residence through to its completion. Using step-by-step tutorial lessons, the residential project is followed through to create elevations, sections, details, etc. Throughout the project, new AutoCAD commands are covered at the appropriate time. Focus is placed on the most essential parts of a command rather than an exhaustive review of every sub- feature of a particular command. The Appendix contains a bonus section covering the fundamental principles of engineering graphics that relate to architecture. The videos contained on the included DVD make it easy to see the menu selections and will make learning AutoCAD straightforward and simple. At the start of each chapter you are prompted to watch a video that previews the topics that will be covered in the proceeding chapter. This allows you to become familiar with the menu selections and techniques before you begin the tutorial. By watching these videos you will be more confident in what you are doing and have a better understanding of the desired outcome of each lesson.